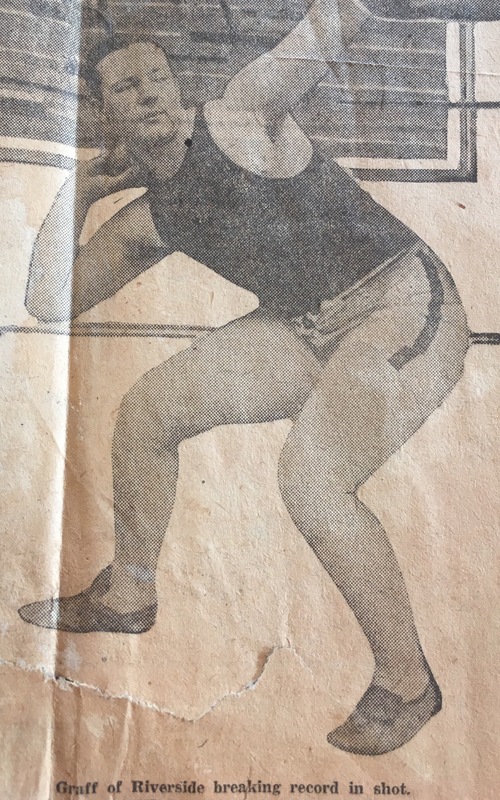 Mario Pacetti of Kenosha High School was a three-time state champion, winning the Class A shot put in both 1930 and 1931, and the javelin in 1930. This is one of the most sad and interesting stories I have come across. Pacetti went on to play football for the University of Wisconsin, where he was a three year letter-winner. However, throughout his life he battled mental health issues, and at one point dropped out of school. He died by suicide in 1935. 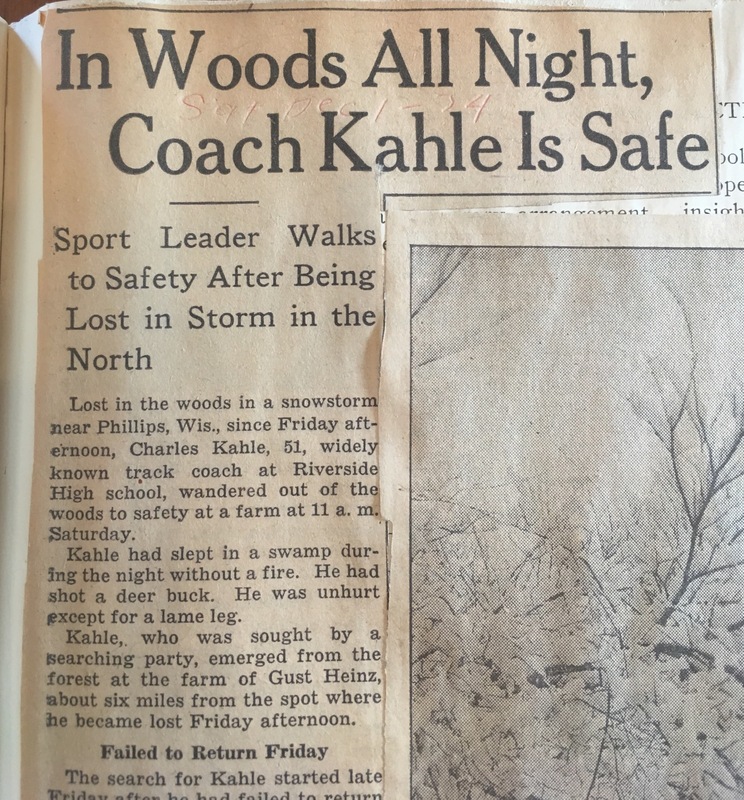 Below I will link his obituary, and a UW historical piece that has links to other articles about Pacetti’s problems and eligibility. Looking at all these football media portraits of the Milwaukeeans makes me appreciate the game for when it was more of a local sport and less of the professional ad spectaculum poured down our throats that it is today. Sad story about Mario P but signifies there was also life beyond acceptance into the NFL. 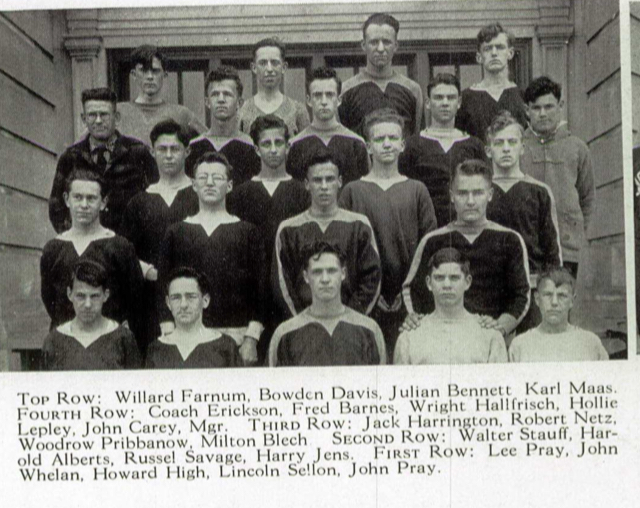 In the front row, kneeling on the left (#87) is 1944 and 1945 Class C state high jump champion Clarence Blahnik. He was also first team all-state in basketball. 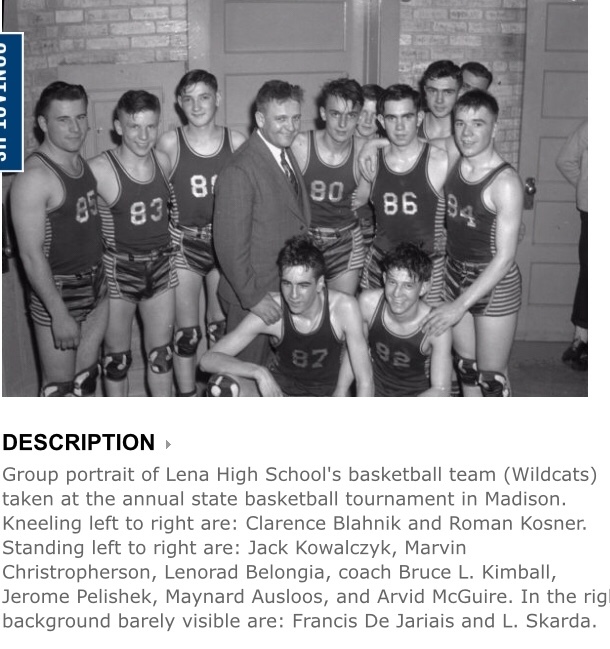 Lena made a Hoosiers style run to the state championship game in 1945. They upset Appleton and Wisconsin Rapids before losing to Madison West (coached by their track coach Willis Jones) in the championship game. schools to make deep playoff runs, as Hurley had a few appearance in the title game, and even won state in the one-Division tournament. races in 1938. He was killed in a plane crash in WWII. Kelso was a member of St. Mary’s Catholic Church in Waukesha, and was one of 22 parishioners killed in the war, which Catholic Memorial High School was dedicated to and named after. 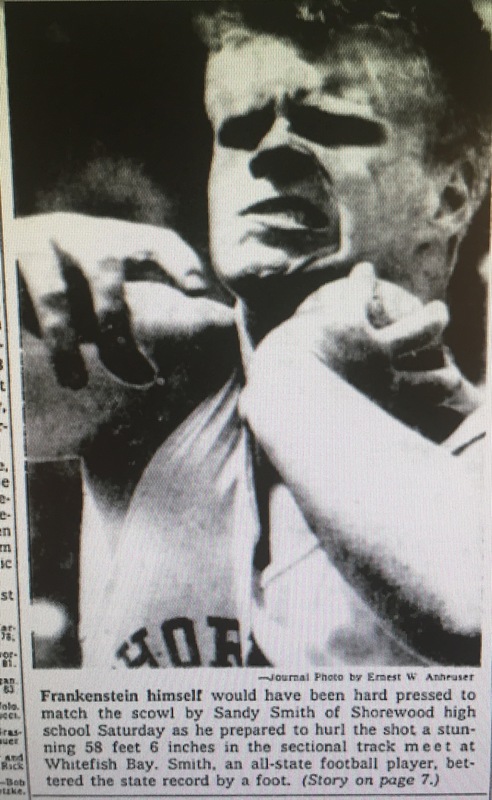 1963 and 1964 state shot put champion Sandy Smith. And speaking of Shorewood…this photo was passed my way a few months back. While nowhere near as old as some of the other stuff I’ve posted, this is none the less a fascinating picture. On the left is multiple time NCAA D3 All-American and WIAC champion Andy Esten. Next to him in legendary Shorewood coach Dominic Newman. 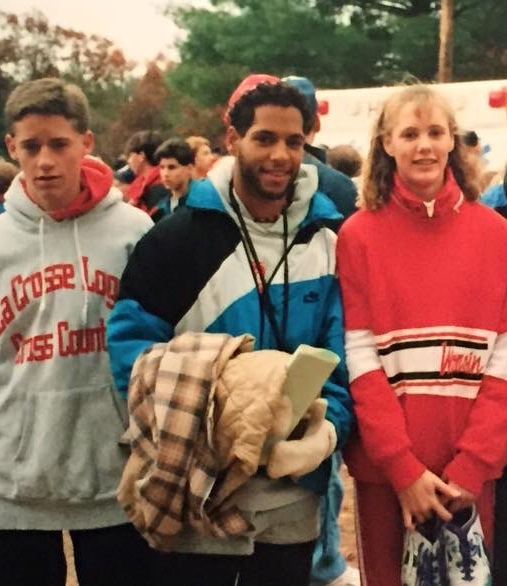 Next to him is three-time state mile champion, two-time state cross country champion, and UW Badger star Avrie Walters. This pic is from the 1990 (?) season. Amazing amount of star power on that Logan squad. Man, who is that good looking guy in the middle? Not sure I’ve ever met him before. It had to be around 1990. Averie’s was 2nd to Janet Westphal and Andy was 2nd to Phil Downs? This was at the state meet. 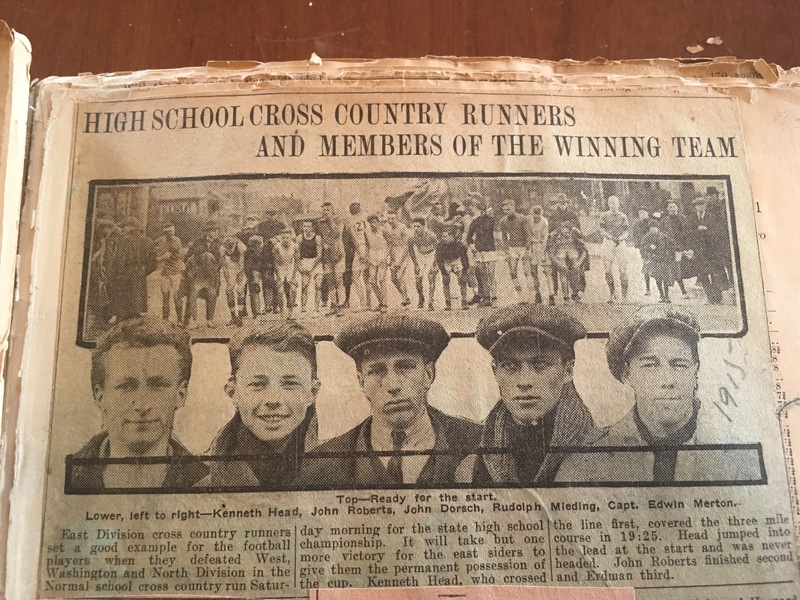 Riverside’s 1915 cross country state championship team, featuring individual state champion Kenneth Head (left) and future state champion John Roberts (second from left). An actual picture of multiple time state mile run champion Henry Pfleiger of Wausau, and later Marquette University. 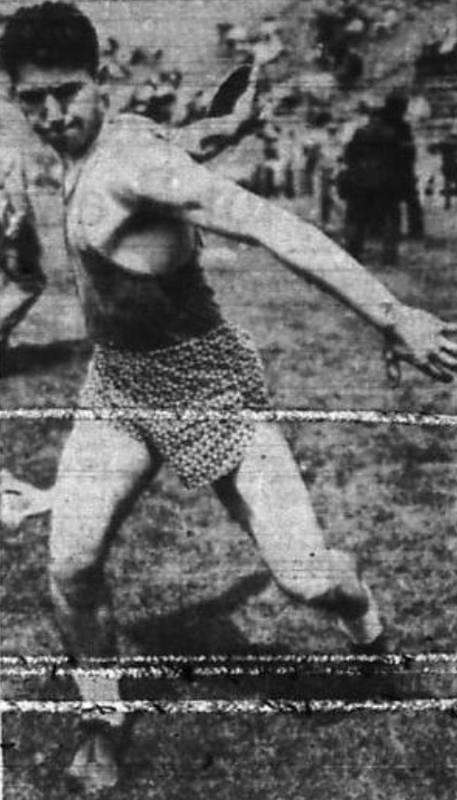 1931 state mile run champion Lee Pray of Shorewood. 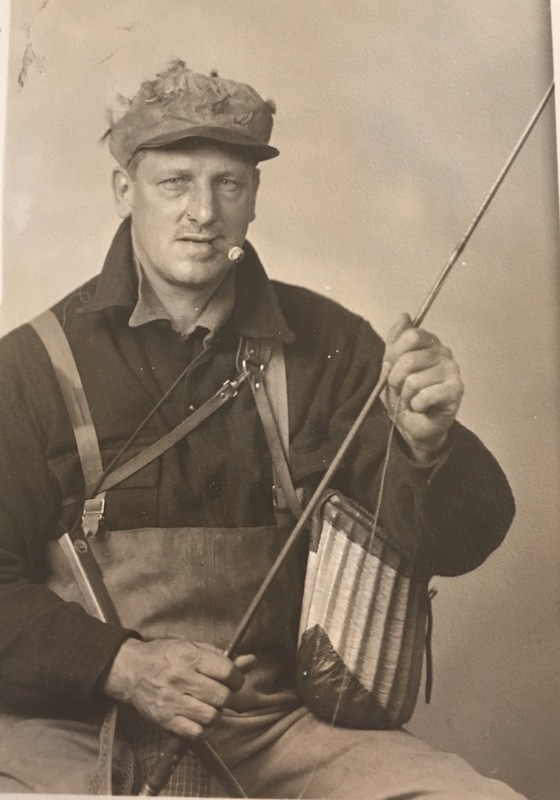 7-time state champion “Graf” of Milwaukee Riverside. I have yet to find a single article or result which contains his first name. 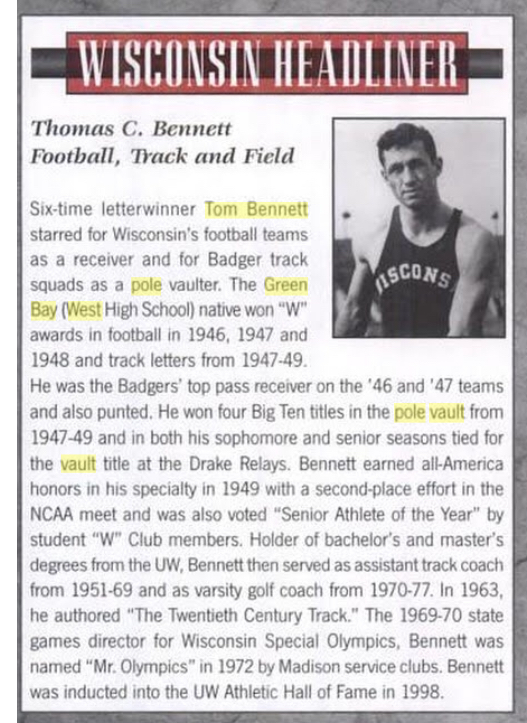 Anyway, he was state champion in the shot put in 1920 and 1921, state champion in the discus in 1921 and 1922, and state champion in javelin in 1920, 1921, and 1922. Riverside won the team state title all three years. 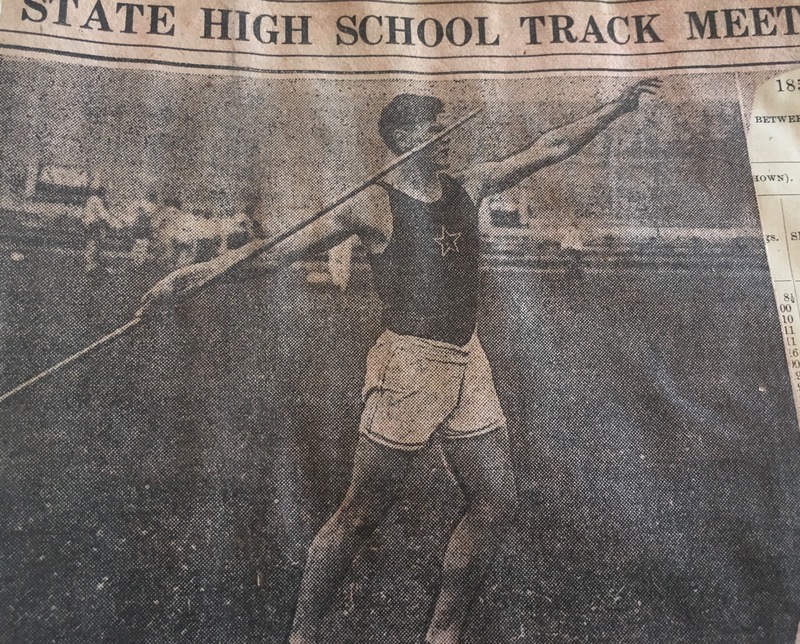 A few pics of 1923 and 1924 state javelin champion John Cinky of Milwaukee West. Love those black stars on the jersey! 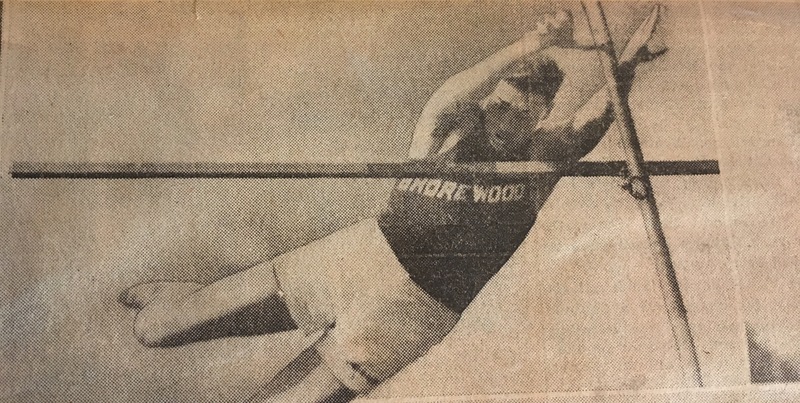 Milton Padway of Shorewood, state pole vault champion in 1935. 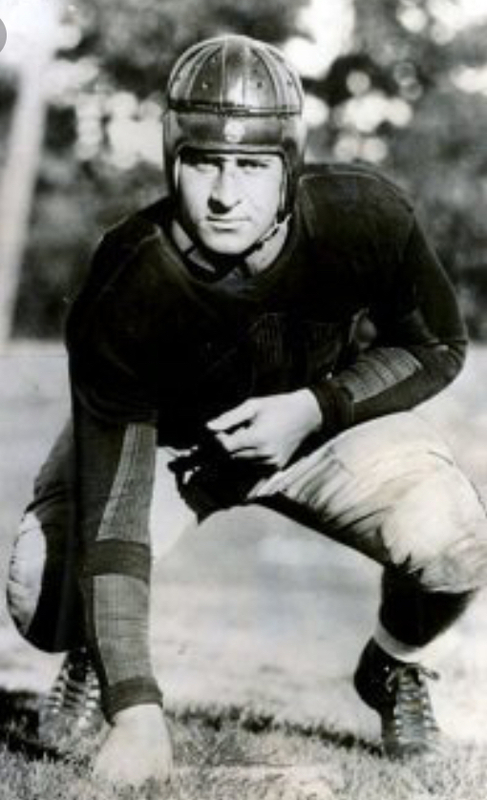 He went in to be a two-time All-American for the Badgers in 1938 and 1939. You found some gems! I will especially with some legends from my school. Thanks for sharing them! Possible trauma to the head from football before they knew about the possible brain damage the sport causes. Oh my this is just classic. Time doesn’t look to electric at 19:25 for 3 miles but who knows what the course was like. Love the caps.